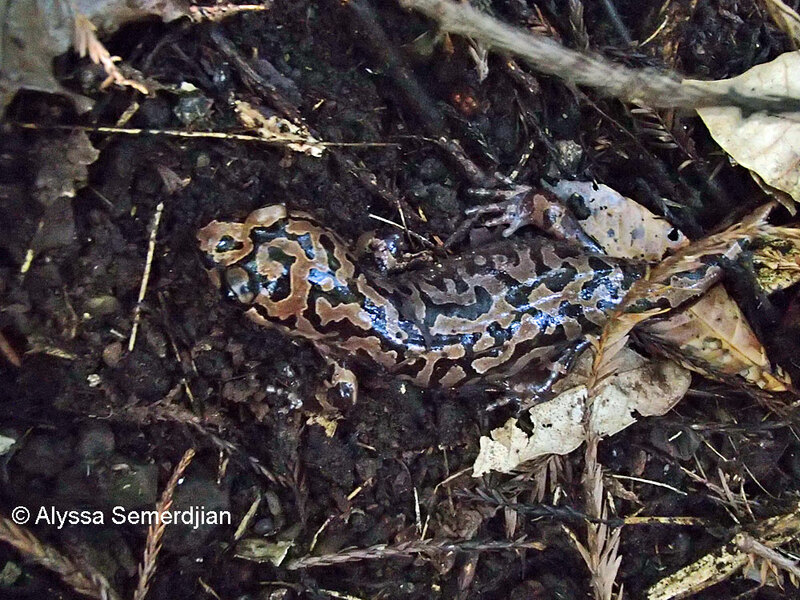 These pictures show a recently-decapitated female Coastal Giant Salamander in Mendocino County. You can see her unlaid spilling out of the wound. After they are produced and before they are laid, the eggs fill up the salamander's body cavity. Oregon Gartersnake, Thamnophis atratus hydrophilus, eating a neotenic Coastal Giant Salamander in Trinity County. These two Coastal Giant Salamanders were found locked in combat beside a coastal creek in Humboldt County in mid July in what is probably an attempt by the large salamander to eat the smaller salamander. The smaller salamander bites onto the large salamanders leg while the large salamder bites onto its middle. 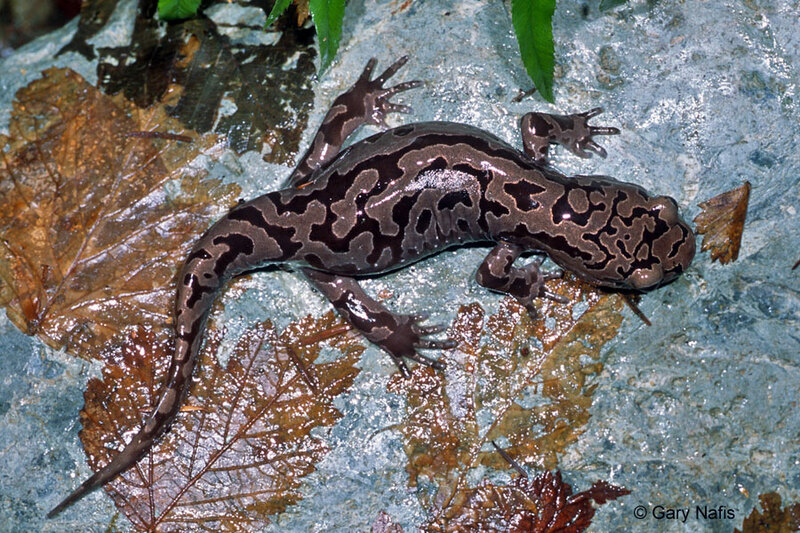 Coastal Giant Salamander larvae shown walking and swimming in shallow water and on streamside stones. You can see the gills working on this tiny larva shown underwater in a small aquarium. Adults are 2 1/2 to 6 4/5 inches long (6.25 - 17 cm) from snout to vent, and up to 13 inches (34 cm) in total length. This is the largest terrestrial salamander in North America. The largest terrestrial salamander in North America. The body is large and robust with a massive head and stout limbs. The tail is flattened from side to side. The ground color of the body is dark brown to near black overlaid with light brown spotting or fine-grained marbling. Very old animals may lose their pattern except on the head. The venter is white to light gray, sometimes dark. 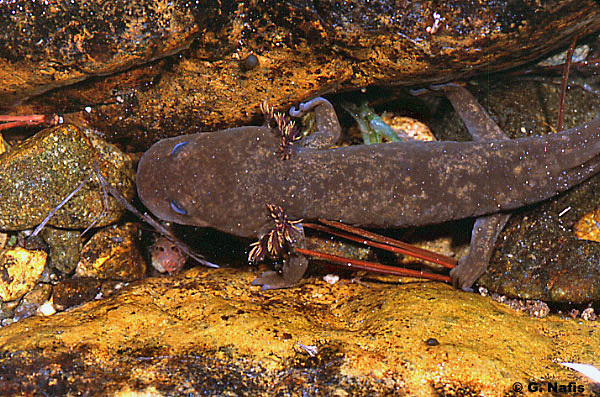 Dicamptodon ensatus, California Giant Salamander, is very similar in appearance to D. tenebrosus. Terrestrial adults often remain in underground retreats, emerging to forage on the forest floor on rainy nights. Sometimes found crossing roads on rainy nights. Adults are typically found within 50 meters of streams. Found under objects near streams, under rocks in streams, and sometimes crawling in daytime. Other defenses include arching the body and lashing the tail and excreting noxious skin secretions. Giant salamanders will consume anything that they can overpower and fit in their mouth, including a variety of invertebrates such as sowbugs, pillbugs, worms, and slugs, and small vertebrates such as small rodents, lizards, small snakes, and salamanders, including other Giant salamanders (and Northwestern Salamanders - Ambystoma gracile, which produce an alkaloid toxin - Rombough, Herpetological Review 48(1), 2017). Eggs or embryos have been found in large larvae and terrestrial adult giant salamanders. Aquatic larvae feed on small aquatic invertebrates including insects and larvae, mollusks, and crayfish, and small fish hatchlings. Occurs in wet forests in or near clear, cold streams and rivers, mountain lakes, and ponds. Takes shelter under rocks, logs, in logs, and in burrows and root channels. 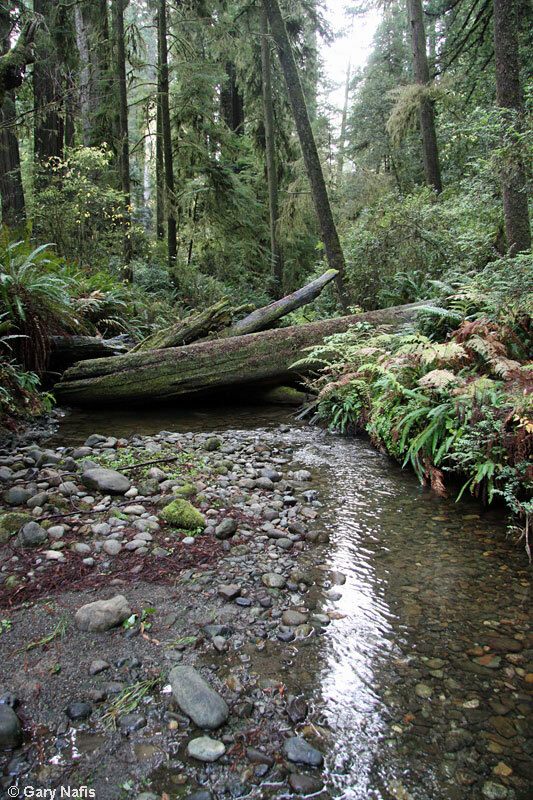 Population densities are highest in creeks with many large stones. Larvae frequent clear cold streams, creeks, and lakes and can be found under rocks and leaf litter in slowly moving water near the banks or exposed in the water at night. Occurs in California from Mendocino County near Point Arena, north along the coast and into the north coast mountain ranges as far east as Shasta Reservoir, Shasta County, and McCloud, Siskiyou County, and north to the Oregon border. From there it ranges north west of the Cascade mountains (and east of the crest in a few locations) into extreme southwestern British Columbia, but is absent from the Olympic Peninsula in Washington. Occurs from sea level to near 7,000 ft. but mostly below 3,100 ft. 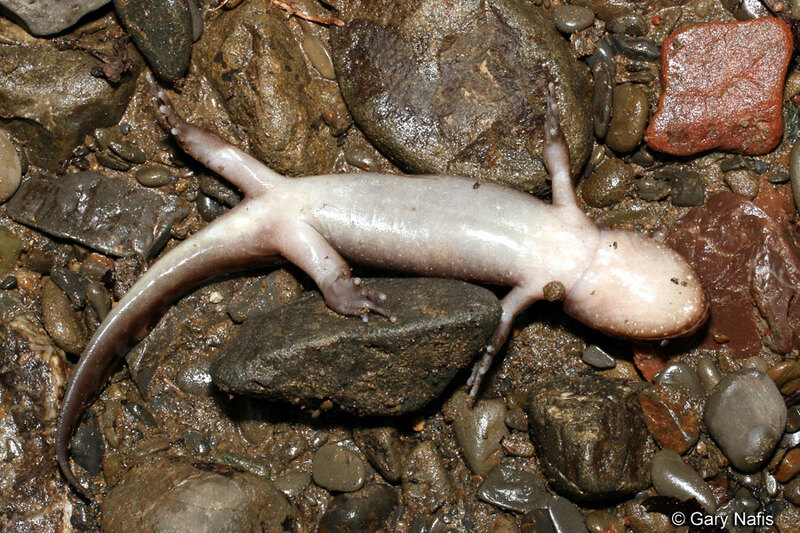 The species Dicamptodon ensatus was split into three species when evidence showed that salamanders from the south Bay area to Sonoma County were genetically distinct from those to the north and from animals in Idaho and Montana. 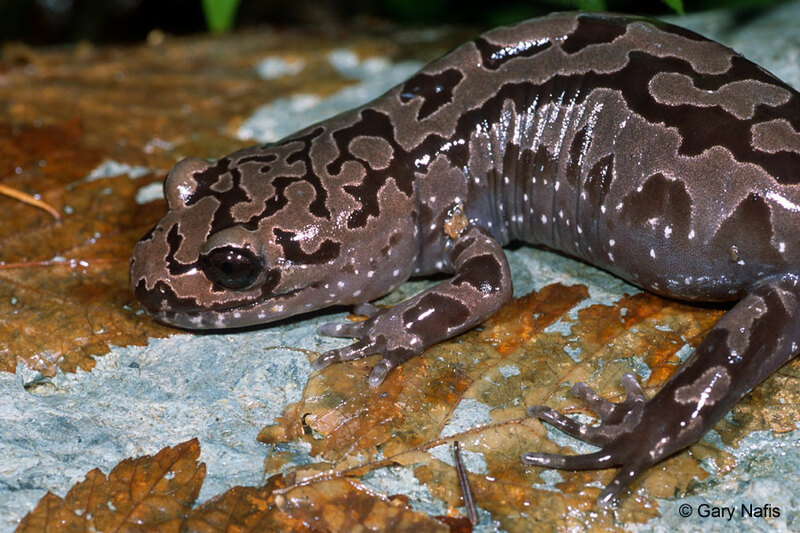 The northern species became Dicamptodon tenebrosus, the southern species became Dicamptodon ensatus - California Giant Salamander, and the eastern species became Dicamptodon aterrimus - Idaho Giant Salamander. The historical distribution of this slamander has probably not declined, though there certainly has been some localized extirpation from urbanization and some fragmentation within the range mostly due to forestry practices. 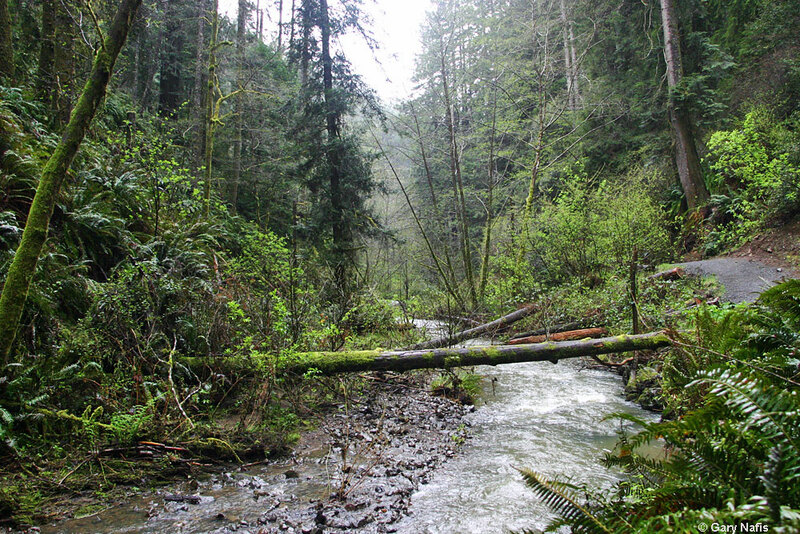 Studies indicate a long-term decline in populations after logging of old-growth forests. D. ensatus is far more abundant in unsilted streams than in streams that have become silted due to logging or other alteration of the land above the stream. Creek sedimentation eliminates access to cover under rocks in the streambed which is critical habitat. ensatus: Latin - dark, gloomy, possibly referring to color or habitat.